someday a sculptor famed he'll be." For nearly 40 years the Milwaukee Public Museum paid Walt Pelzer to hunt Bengal tigers and gaur in India; mountain lions, mountain goats and mule deer in the Rockies; and leopards, lions and antelope in Africa. He was paid to hunt brown bear in Alaska, sea lions in California and jaguar in Guatemala. When he and his team brought the specimens back to Milwaukee, they created some of the finest natural history dioramas in the world. 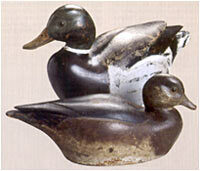 Walt Pelzer also made duck decoys, for the museum paid him to go duck hunting as well. Pelzer literally teethed on wooden ducks. Pelzer's daughter Elaine still has one of the pair of miniature wood ducks, which his mother Lillian gave him as an infant. Walt promptly chewed its bill off. From this auspicious beginning he went on to become one of the world's foremost museum taxidermists and one of Wisconsin's top decoy makers. Pelzer was born in Fort Atkinson, Wisconsin on October 16, 1911. His father George was a cabinetmaker, while his mother was a homemaker. Walt made his first stab at taxidermy when he was eight, using shiny seeds for eyes when he mounted a Prothonotary Warbler he had found dead on the ground. By age 13 he had learned enough from pamphlets and practice to charge neighbors $15 a head to mount their deer. After graduation from Fort Atkinson High School in 1930, Pelzer worked briefly on his uncle's farm, later painting barns while taking summer classes at White Water Normal School and night classes at the Layton School of Art in Milwaukee. While he kept up his taxidermy business, he took university extension classes in biology and comparative anatomy. About 1932 Pelzer's high school manual training teacher took him to Milwaukee and introduced him to Dr. Samuel Barrett, Director of the Milwaukee Public Museum. After seeing the portfolio of mounted animals that Pelzer brought along, Barrett offered him an apprenticeship in the museum's taxidermy department. "There is no money for the job," Pelzer recalled Barrett telling him, "so get yourself a meal job somewhere." Walt's earliest, a dozen solid bluebills and marsh bluebills (ring-neck ducks), were made from blocks of wood he bought from taxidermy assistant Earl "Bud" Loyster, who had planned on making decoys himself. Pelzer recalled that Loyster had cut blocks to length, but had gone no further. The blocks had split before Walt started to work, so the filler applied shows through the paint of many. These decoys were influenced strongly by Gromme's decoys, but Pelzer developed his woodworking skills and the beginnings of a personal style before he finished the last of the dozen. Caught in the depth of the Depression with nothing but his part-time dishwashing for income, Pelzer hitchhiked from Milwaukee to Memphis, Tennessee, in search of a rumored taxidermy job. The rumor proved false. Nonetheless, after casting about, he found another taxidermy job paying $2 per day and stayed. Six weeks later Dr. Barrett wrote from Milwaukee to say, "Come up if you want a job with the WPA. I'll wire you money if needed for travel." Pelzer accepted and went to work at the Milwaukee Public Museum full time, his salary paid by the federal Works Progress Administration for his first 18 months. About 1935, after seeing a plaster rhinoceros that Walt had sculpted in his off-hours, Dr. Barrett hired him as a full-time staff member at $125 per month. Owen Gromme, with whom he became a friend, invited him to the family farm in Briggsville where the matchmaker casually introduced Walt to his second cousin, Florence Bush. The two married in 1936 and had two children, Diana and Elaine. He and Gromme hunted with Earl Voelker, another Milwaukeean, who had a hunting shack on Puckaway Lake. "It was in such bad shape," Pelzer recalled, "that he sold it after buying another piece of property where we built a new shack with bunk beds...It was the size of an oversized garage, with a stove, table and chairs...We did the cooking on an oil burning stove. I remember burning my eyes on it." Pelzer's bluebills are most readily distinguished from Voelker's by the generally deeper groove between the wings. Each man carved eyelids and recessed the anchor line screw eyes on some, but not all, of their decoys, so these features don't necessarily determine the maker. Pelzer said in 1992 that he had made no sleepers or preeners, nor had he made any miniatures or other ornamentals. He did add a group of solid-bodied puddle ducks to the rig sometime before the outbreak of World War II, including six mallards (probably 4 drakes and 2 hens), between two and six black ducks, one pair of pintails and about four wigeon. Warren Dettmann's hollow-carved decoys always impressed him, so Pelzer started a similar group that, unfortunately, he never entirely finished. When he and Florence were building their house on 94th Street in the early 1960s, he sold the entire rig to Milwaukee decoy collector J. Grigsby Markham. Among the hunting decoys were the unfinished blocks, which Pelzer recalled were in all stages of completion - cut boards, glued up blanks and fully carved, but unpainted, decoys. At least a couple of the unpainted decoys were believed to have been the wigeon that Grigsby Markham later had painted by Warren Dettmann, only to refuse delivery when he discovered Dettmann's steep price for the completed birds. Never hunted over, Dettmann eventually sold them to a collector. Also during the 1930s and '40s Pelzer continued a childhood fascination with Native American cultures, especially those of the Great Plains. He made Sioux-style pow-wow outfits from scratch, using museum specimens for patterns and information on authentic techniques such as "Indian scotch-tape" - split sinew wrapped wet around the quills of eagle feathers to secure them to the war bonnet. He made one bonnet's skullcap by tanning the breast skin of a swan that was too damaged for museum purposes, leaving the down in place to provide the most luxuriant of coverings. Pelzer continued his woodworking during the 1940s, making a hobby horse for his daughters based on photographs he took of a carousel horse at the State Fair, and a cherry drop-leaf table with eight chairs. Each chairback was carved with a unique design, including a trout, a bear, a bluegill, a squirrel, a rabbit, a pheasant and a deer. Over the years he sporterized several military Mauser rifles, both for himself and others. While Pelzer mounted birds, fish and reptiles as well, he is known primarily for mammal taxidermy, especially big mammals. Among others, he designed and built the museum's dioramas of two mule deer stalked by a mountain lion, the Alaska brown bear and various Africa and India scenes. In 1964 he succeeded Gromme as the museum's chief taxidermist. In 1966 he finished the largest open diorama in the world, the Crow Bison Hunt, in which two men on horseback pursue a galloping herd of eight bison across the Wyoming plains. No horse or bison has more than one hoof touching the ground, while a calf is completely airborne, supported by steel rods running into its mother's side. The curved backdrop, 80-feet-long, was painted by museum artist Bill Schultz, also a decoy maker and well-known carver of decorative birds. Walt Pelzer retired as Chief Taxidermist in 1972, but that hardly slowed him. In addition to numerous big game mounts for private clients, one major project was to mount family groups of big game animals for the Manitoba Museum of Man and Nature in Canada. Working in his basement, he produced groups of elk, moose, polar bear, wolves and bison. After he completed them, he removed the basement stairs and hoisted the mounts out with a sliding block and tackle attached to the stairway ceiling. Walt Pelzer died in Wauwatosa on September 3, 1998, two years after Florence. He was 86 years old. His last Sioux-style pow-wow outfit is on long-term exhibit at the Hoard Museum in his hometown of Fort Atkinson. 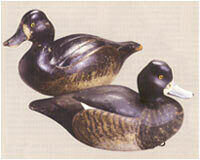 His rig of hunting decoys has been dispersed to a small number of collectors. Thanks to Herb Desch, Diana Pelzer Diedrich, Sam Dyke of the Ward Museum, Guyette & Schmidt Inc., Gene & Linda Kangas, Bob & Kristin Lehmkuhl, Al Muchka, Sue Otto, Joanne Peterson, Lynn & Elaine Rettig and Greg Septon for their assistance. For the complete story, please see the Nov./Dec. 2001 issue of Decoy Magazine.